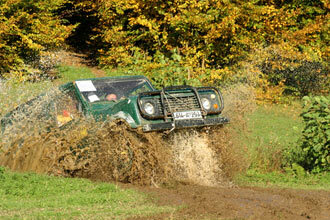 Take to the hills through tough terrain with this exhilarating Half Day Off Road experience. Jump behind the wheel of a rugged 4x4 wheel drive vehicle and experience the thrill and pure adventure of off road driving. You’ll encounter a whole heap of steep muddy slopes, big holes and challenging gullies. You’ll need to put your best driving skills to the test as the wheels spin in the mud, the vehicle slides when you pump the breaks and the suspension is pushed to its limits over the bumps. You'll learn to drive on some of Britain's most rugged and uncompromising terrain on this unforgettable four wheel drive adventure. We have carefully selected the best off road driving locations across the country to give you the opportunity to indulge in some serious four wheel driving in beautiful, yet challenging locations. You'll learn lots of fascinating driving techniques - such as hill starts, driving through thick mud and vehicle control on steep slippery slopes. This is an amazing experience for anyone who likes a bit of the rough stuff! 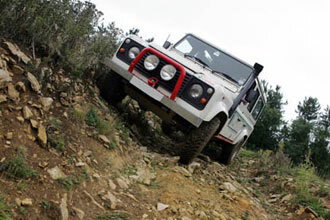 Your session begins with an introductory briefing on off-roading techniques, together with an explanation of four wheel drive systems. The instructor will give a demonstration drive and then it's time for you to take the wheel! Please note at some locations there is an option to purchase damage waiver insurance on the day of your experience. In the event of an accident the damage waiver will cover all or part of the damage caused to the vehicle(s) however this will not cover damage caused by reckless or negligent driving. Further details are available on booking. Your adventure will last approximately 3 hours and you'll be at the controls for up to 50 minutes. This experience is for one person, there'll be a maximum of two other people in your group. You need to be fit to drive. No alcohol or drugs prior to the event. This is may not suitable for people suffering from diabetes, epilepsy or angina pain. If in doubt please check before booking. Optional indemnity costs £20 and is payable on the day. 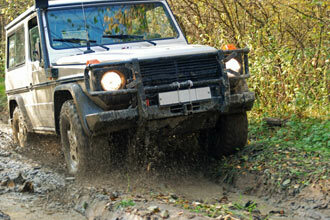 You need to hold a full valid UK or European manual driving licence in order go off roading. Enjoyed this very much. Instructors were very encouraging and pleasant company. Very exciting for someone accustomed to normal tar roads and left me thinking that it would make a great hobby. Great instructor, good company, lovely vehicle, plenty of terrain, super views. Thank you for your review. I'm sorry you felt your chosen location was not up to standard. With this package, we have carefully selected the best off road driving locations across the country, all of which usually involve a whole heap of steep muddy slopes, big holes and challenging gullies so I do apologise if this wasn’t what you were expecting on the day. I am however pleased you liked the instructor and the Land Rover you were driving.